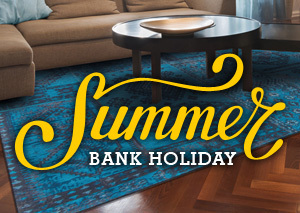 Summer Bank Holiday Sale is ON, come online and grab your favourite rugs from our 15000+ designs, we have all that you are looking for which will suit and compliment your interior and style. So, what are you waiting for? Use promo "SB10". Sale Ends Midnight Monday 27th Aug, 2018.SHOP THE SALE NOW. Offer Valid till Midnight Monday 27th Aug, 2018.